To Obscurity And Beyond features nine mind-blowing Afroskull originals. Jazz legend Ronnie Cuber joins an expanded horn section to breathe fire into Joe Scatassa’s high-wire horn arrangements while the rest of the band pours on the gasoline. To Obscurity and Beyond is the culmination of four years worth of writing and recording specifically designed to melt your face! 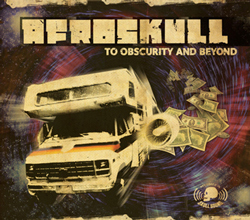 Currently this album is available directly from Afroskull via this page (the Afroskull.com Store) or at CDBaby (see below), an external site and reseller. Purchasing the physical CD from us will also give you access to download the full album in 256k MP3 form - ripped from the original 24-bit masters. Please check the following items below you would like to add to your cart and then click the 'Checkout' button below. The Afroskull.com Store uses Paypal, however a PayPal Account is NOT required.